A Scout sits on the WC net at Rieneck Castle. 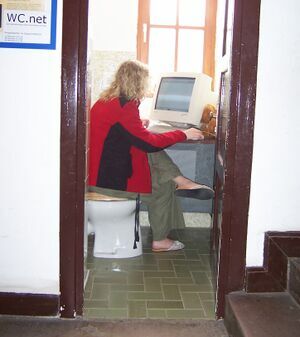 This internet connection is probably one of very few ones that are situated in a bathroom. However, the toilet itself is not recommended for the normal use of such a facility. 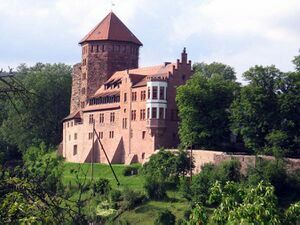 Rieneck Castle is a castle built by Ludwig I, Count of Loon and Rieneck, in the year 1151. The city of Rieneck is situated about 80 km east of Frankfurt. 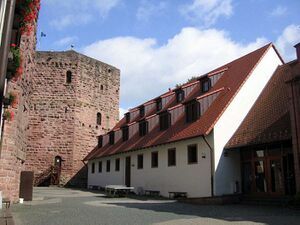 The castle now serves as a Scouting facility and is owned by the German Christian Guide and Scout Association, VCP. The castle's programme includes many interesting Scouting activities such as arts and crafts, pioneering and middelage trades and offers accommodation, Internet connection (see image to the right) and a campsite. The official homepage of Rieneck Castle.